My Blank Slate Catalina dress. I made several muslins but just never got the fit worked out to my satisfaction. I wore this dress exactly once. Pity too, because the fabric (tencel twill) is lovely and wasn't cheap. 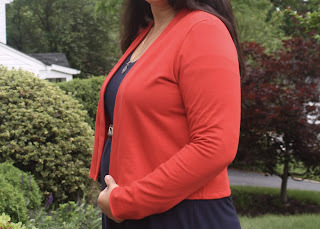 A cropped Blackwood cardigan. This fabric just has a bit too much body for the pattern, I think, and the sleeves are a bit tight. I often put this on only take it right off again. It's still in my closet because I haven't given up hope that I will stumble upon the right way to style it. The sleeves of this cotton/lycra Plantain tee came out too tight. I wear it to sleep sometimes but it's not very comfortable. The mustard Plantain tee isn't my color, plus the fabric is just kind of icky. I wear it once in a while but always feel sloppy in it. This Plantain tee looks better in person than it does in these photos, but the color is a bit blah for me. Plus the fabric is a bit thin, so it shows all the lumps and bumps. The tee makes me feel exposed, so I don't really wear it. All my fails came down to fabric choice or poor fit - and four of five are knits. I made five Plantain tees last year and they all fit a little differently because of the difference in stretch percentages and fabric content (and three of them made it into the "fails" category). I find sourcing knits to be very hit or miss, because I do most of my fabric shopping online. That won't change anytime soon, so I guess I ought to expect more knit fails in the future.